JACKSON — Fish and Game officials believe they have found the remains of a Canadian hiker reported missing two weeks ago on Mount Washington. 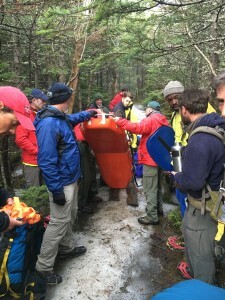 A 25-person search team late Saturday afternoon found a body believed to be that of Francois Carrier, 47, of Drummondville, Quebec, off the trail near Tuckerman’s Ravine at an altitude of 5, 300 feet. After a preliminary investigation by the medical examiner at the scene, rescuers from the AMC, Mount Washington State Park, Androscoggin Valley Search and Rescue and conservation officers from New Hampshire Fish and Game transported the body down the mountain. An autopsy will be conducted in Concord to determine the cause of death. Carrier was reported missing on May 12 when he did not return home from a trip to the Mt. Washington area. 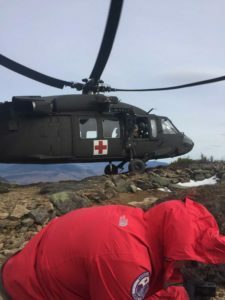 Officials say there were several reports of a man matching Carrier’s description on May 9 around the Pinkham Notch area, and the search was suspended. Searchers had combed the area for five days with dogs, a helicopter and numerous searchers. A K-9 team located Carrier’s back pack, which he apparently lost while hiking up the auto road. Carrier was vacationing in the Mount Washington area, checked out of his Gorham motel on May 9 and was last seen walking north on Route 16 near the AMC Pinkham Notch lodge.